High-end graphics cards almost always consume a minimum of two expansion slots. Depending on the build, however, you may physically be limited to a single slot which can be a problem if you simply can’t sacrifice the graphics processing power. Example builds that could be tight on space include SFF systems or those with multiple add-in cards (RAID controllers, sound cards, PCIe SSDs, etc.) In that scenario, most would turn to watercooling but there’s now an air-cooled solution that may be worth a look. The Galax GTX 1070 Katana features a single-slot air cooler that measures just 16mm at its thickest point. Underneath the black shroud is a copper heatsink with a vapor chamber that is actively cooled by a single fan. The assembly may look sleek but Galax claims it’s sufficient to avoid throttling, even in thermally challenged environments. The card packs 1,920 CUDA cores and carries a base clock of 1,518MHz with a boost clock of 1,708MHz – values that are just slightly higher than what you’ll find on a reference GTX 1070. It requires just a single 8-pin cable from your power supply in addition to what it draws from the slot. 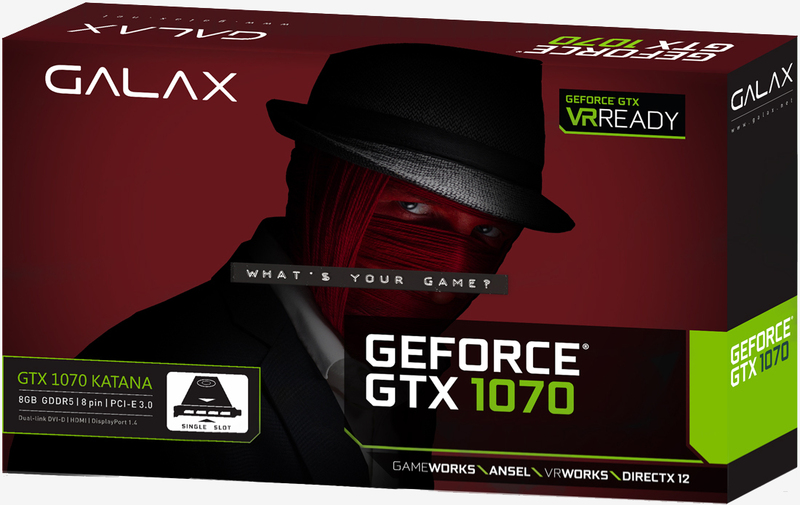 Galax hasn’t yet said how much the GTX 1070 Katana will sell for or when you will be able to purchase it. We also don’t know how loud the fan will be although I suspect it’ll be a bit noisier than what would accompany a standard dual-slot card.